We can shrink the nib by the chimney (what was the back of the original house) back a bit to leave maybe 100mm sticking out. Then board across the alcoves from that nib to the chimney breast. We thought we would have the bottoms of each alcove hollow ( to store logs in) and maybe at the tops some recess boxes for books perhaps? The idea of bringing them forward a bit is to help sound proof between our adjoining houses and also so that the difference between the new extension and the original room is not as obvious. There has to be a small nib left otherwise we will have to have a steel pillar put in which is extra money we don’t have. So, I want to ask your opinions of whether you think this idea will still look fine? If we had the steel then the new wall would look even more vast! LOL. Overall it’s about 24ft. My other issue is that the right side of the chimney breast is narrower than the left side and we can’t do anything to equal them out now. There will be 200mm difference between them which I know will bug me. Lol. It’s not central to the room so it’s not the focal point but it might be more noticeable should we put the log storage in. 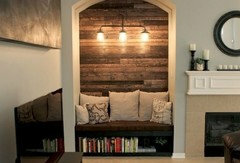 Firstly if the alcove disparity bothers you then add extra boarding to the sides to even them up. I had thought of that @Jonathan but the log burner wouldn’t be central then as the flu is already in place so the log burner would be offset. Secondly- you might want to consider if this alcove is deep enough to store the logs you want so the round cut ends are displayed. 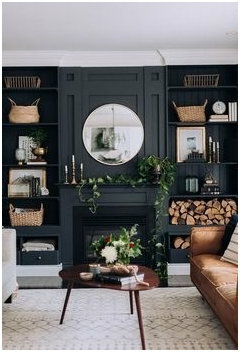 I suspect the easiest thing is to put a door on the front of the alcove, paint it black and then cover it with rounds of logs for the full effect. The inside of the cupboard can then be shelved for logs and books. @Minnie - yes, not doing the bar by the side wall now. Was too awkward as the space we are gaining by knocking down an internal support wall would be lost by building the back wall out again. @ Jonathan - yes there will be enough depth to store the logs on the ends - even if they stick out past the alcove a bit, it won’t matter. There will always be the odd one that is larger than the others but we can just leave it outside until we need to burn it. I would go for the logs store like minnie suggested on get pic to the lhs but! and here’s the but, I would probably bring that nib down to as small as possible (you recon about 100mm) id stud the long wall and plasterboard it so it’s flush with the nib face and plaster the lot! You’ll loose 130mm of your room but that 100mm nib would really annoy me! 13 cm isn’t a lot and you could do that bit yourself to save abit as the materials would be next to nothing! Just my thoughts and very easy to do at this stage, the unevenness of the alcoves wouldn’t bother me at all with a flat wall and no nib. The joiner did say he could baton it all out to bring the wall forward but the rooflight and all the lights might be out with the other side then as it’s symmetrical at both ends. Plus the extra labour doing all that and for all the wood etc will probably end up costing the same as putting in a steel. 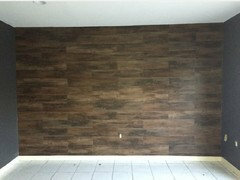 What will happen is the new grey block wall will just look like it’s been set back from the original wall of the house. @Minnie - I do like the idea of all logs on the one side and it would break up the visual of unequal sides. Plus saves boarding it out as well and so we can have deeper log storage. Thanks! We do have some books to put on shelves (not loads) but I’m not a trinket person so we don’t have loads of junk to display. Ha ha. I only thought of a bar as we could put some antique mirror at the back of it and hang glasses off the shelves. I don’t really do sideboards so that side of the room is going to be lacking in interest I think. Like Minnie’s idea of all the logs on one side. If you try to or decorate the alcoves the same it will just draw your eye to the difference. Seen lots of designs on Houzz with off centre fireplaces with different designs to each side. A friend of mine had a bigger alcove and put two varnished scaffolding planks up as shelves - the wall she painted a dark blue but the nib was in an off white then she continued with the scaffolding shelves on the next wall (extension) with the same dark blue. Looks really good (mainly how she has dressed the shelves). She has managed to mix modern and rustic. Not sure my explanation has done it justice. Sorry can’t include a pic as every pic I have has someone on it. I’ve kind of semi mocked it up - but I can’t do everything on the app so the left side would have inset boxes/shelves of course and the right side top section would match the left so one side doesn’t look deeper than the other. Ignore the colours as for some reason, the app has different colour tones for different objects but the chimney breast and left wall are supposed to be the same colour. I then had the alcoves and tv wall the same. Not sure how I will decorate them as yet - the dining one is vast and scary. lol. Hi Tani. Just my personal thoughts but I would try the dining wall in a lighter shade, just zone the table with art (did you have an issue with a pendant over the table?) and maybe add a floor lamp behind the sofa. I'd also try the chimney breast in the light shade with a simple mirror. i might also paint the entrance door in the wall colour. Are you recessing the tv? I would lower it in any case. I'd probably take the shelves to the ceiling. PS has the kitchen started yet? Ah it’s ok as I haven’t designed the decor I’m having as such - I just stuck all that on there to give a rough idea of what I would be having. Ha ha. Hard to find things on that app so can’t really decorate it how I want it as such. 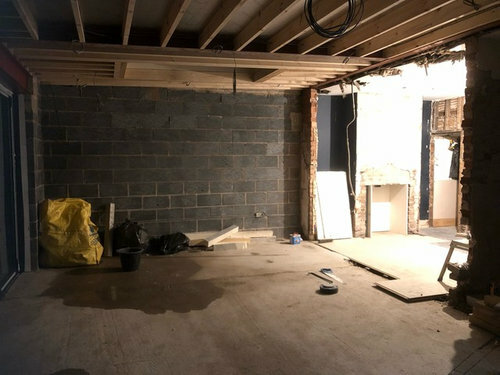 The white door to the left of the tv is the storage cupboard which will be semi concealed and the same colour as the wall. Tv isn’t recessed but will just be wall hung. There will be hanging lights above the dining table - again, haven’t put these on the plan yet. Of course they can’t plasterboard or anything until it’s all watertight! oh poor you, what a nightmare. How long have you been living like it now? Is there any reason for the delay? Yes we can do lighter in the dining tand keep the lounge dark and moody :0) Good idea. :0( boo hoo. Not even started thinking about the lights yet - thats just another thing to spend hours on, urgh. So bored of it all now, ha ha. Delay - my builder has personal issues and also his biz partner (dad!!!) left on the quiet and messed up the quote so he has ended up being out of pocket on quite a lot of things. It gets him down sometimes and hes not good at organising people or being a site manager. He is good at what he does though which is the only reason we kept it going. Started last July i think with the roof re-tiling and en-suite and its still not quite finished. LOL. It's not a cheap light :( A company that shall remain unnamed did something very similar for a fraction of the price, not sure if they decided not to stock it or to stop when the new copyright laws came in..
it must get so tedious, we were planning on doing xyz which I need to cost before working out if we can afford a new kitchen but I'm not getting very far with all the must do jobs! You are doing way more than we've got planned! You're both in a difficult situation, imagine your dad stitching you up, not good..
At least the builder is good though which is a big positive. Do you have a new ETA for completion? I know, and i do feel bad for him. It’s really poor. Ps @Jonathan - meant to say re the wall cladding, that we are planning on having the reclaimed brick slips on the kitchen wall (opposite the dining room wall) so it might look too busy? So, if we keep the log stack to the right side as per the image you posted @Minnie - what are suggestions for the left side ‘alcove’ ? Should we box out to the nib so its as per my pencil sketch top view/mock up - with internal shelves/storage or do something else? I’d deffo go steel or stud out, which ever is cheapest, I dont have sortware to take the nib out and see what it looks like flush but in my mind i ‘think’ it will look better, a 65” tv isa fair size and you looking at a very long unit for below that won’t look lost, I thinking about 2500mm, I have a 55’ tv with a 2100 mom long unit and I could have went longer, pictures on the recast of the wall is an option too! Easy space to fill for me. @ Beano - the tv is on the other wall though and not where the nib is? The nib i mean is to the left of the chinney breast as you look at it. I will keep the one on the right to stack with logs. I can mock up a flat wall on the left to see what it looks like. 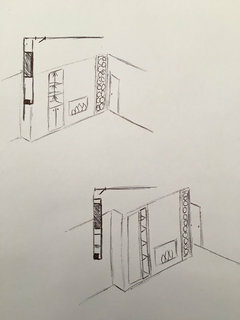 0k - so I have re-done the plan to show the wall as it would be if we replaced the nib with the steel post ie so the nib doesn't stick out past the new wall. 1) just put sound proof board at the back and leave it as a shallow recess - not sure what I would fit on shelves 6" deep?? 2) just board across so it's all flush and one longer wall up to the Chimney breast. Posts crossed @Minnie - just read yours now. We are putting another tv ariel on the dining room wall just in case we ever do decide to swap the lounge around ie say in Summer when we don't need the log burner on and want to sit in the sunshine. It will get hidden with artwork in the meantime. Might be too far over to put the TV past the fire on the left unless we put it on a big arm that could swing around as the sofas wouldn't be facing it? My husband hates sitting on his side to watch TV as we also considered putting it on the wall by the door and switching the sofas around, but then you walk past it coming in and out of the door, LOL. Yep, I like that! That flush wall works for me and even the shallow recess then to the chimney breast, it works because of the wall colour, it defines the area very well, for me anyway, nice gallery wall of pictures right across that wall would look great, just for reference, I had my tv on my wall with nothing else on it waiting to get my unit finished off, it looked very bare, again, that’s just my thoughts, we all have our own interior styles! Yep, flush wall for me! one last picture - this is making it flush straight across the chimney on both sides by the 6" so there is no recess on the left at all, but still one on the right to store logs right up the front of the chimney breast. Bit like on the pic @Minnie posted. Ps id just pull the dining table a chairs out abit for space perspective, looks a bit pushed into the corner? The last image looks really well too but the log stack makes it look really off/heavy to the rhs, esp with the wall alone colour, if you removed the logs that would look better! Tbh the last one is the one I would prob go with and work out some sort of Lower log stack at the rhs or better still at the lhs? Balance the length of the wall out from the radiator over to the breast, then gallery wall and a couple of small pieces of art to the rhs of the breast! Hope that makes sense. Hi Tani. 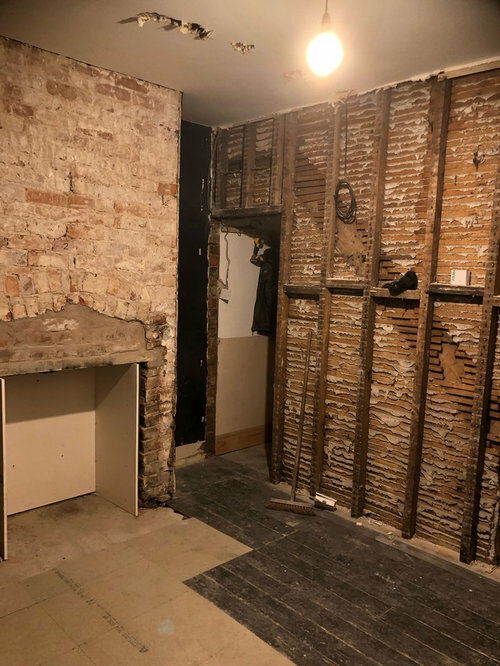 It’s been fascinating reading all of your renovation dilemmas. Can’t wait to see the end result, especially the kitchen. Won’t be too long now till it’s all finished hopefully. Regards chimney breast and nib wall, I like the log cupboard idea on right but is the understairs doorway moving? Currently sits flush with back wall which might make it hard to put anything on right side of fireplace. With the nib personally I might build it out so it’s flush with chimney breast then have recesses for cupboards shelves etc. hard to explain so I did some sketches. If you can put log store on right then you could have built in storage of equal size on left. Or possibility of having a flush panel full height cupboard for drinks cabinet done in same colour as the wall? Either way I think I’d take it all the way to the ceiling so it looks like everything is built into the wall. Loads of possibilities tho. Hi Rachel, ah I worry all the time about being a Dilemma hog and do feel guilty about asking so many questions, haha. I hard to work out your own place vs other people's homes. Never thought about making the chimney even wider. Would it still look ok with my fancy fire surround though?? I've already bought it as had one in my last house and loved it. It's a big Louis style one and wanted it to add some character/drama so it's not just all 'modern' in the room. The cupboard door is flush with the wall but we can move it so it won't be sat far into the alcove. I just have to check it all and measure it up. The door can be narrower as well as it's only for storage in there and access for the tv cables etc. Ok - so ignoring the colours and the depth of the logs on the right because if I move them back, they disappear behind the wall and you can't see them. 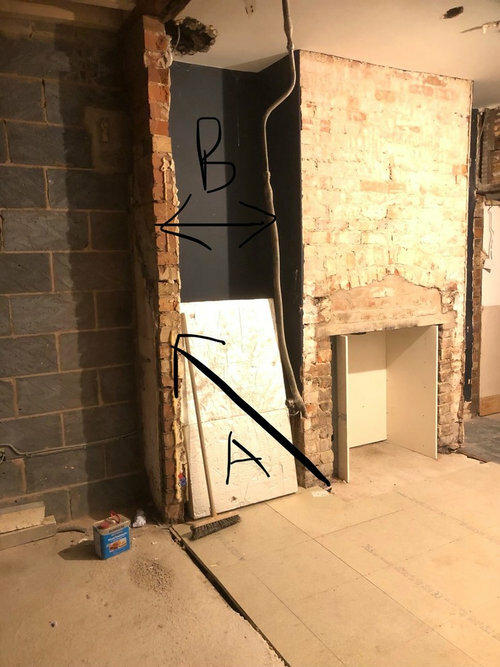 Also the wall at the right of the chimney breast might not run in line because of the cupboard door so it would be left as a deep recess for logs and storage at the top perhaps. 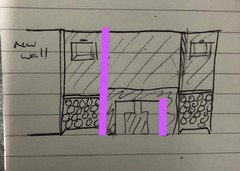 I also can't add in nibs to the left of the fire so you will have to imagine it would have boxes in it for display/logs as per @Rachel's sketch. Not sure which way to go now, haha. I need to store logs as it will have a working log burner so it needs to be practical. which do you guys think looks better? 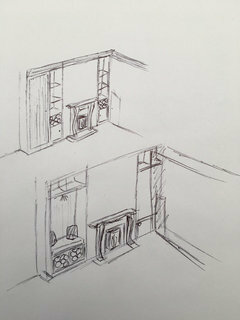 a) make the chimney breast wider on the left and inset recess storage shelves as above & Rachel's drawing? Spoke to our builder/joiner and we just measured it all up. 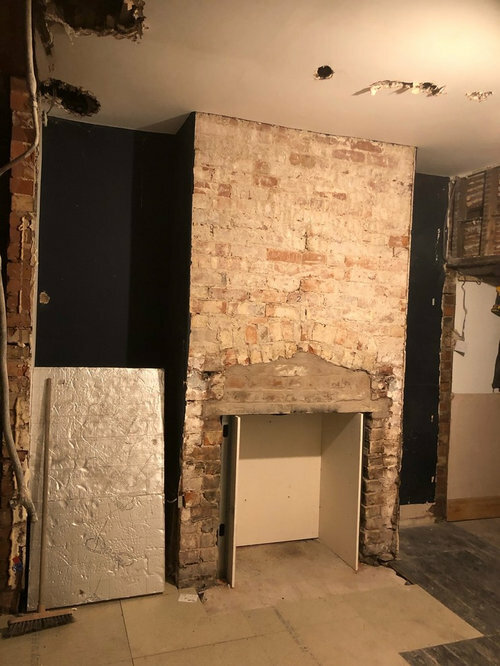 Basically, if we built the wall out to make the chimney breast wider then although we could put the same sized log storage pockets in either side of the fire surround to make it look symettrical, the left side of the wall would still be wider. I can't change this without putting the steel in to reduce the size. Ha, nice idea re the seat! We only have about 800mm gap on the left though so by the time its boarded and plastered, it might leave us with 750mm. I do wonder if having completely different recess sizes on the left would look better then in that case ie if we still made the breast wider all around, but had wide storage for logs at the bottom with a little bed seat for the dogs then wider shelving. 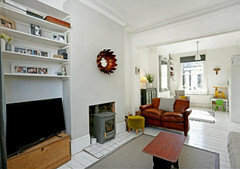 So the randomness would detract from the fact the fire surround wouldn't be quite central to the overall wall width. Will see if I can sketch it up..
Any other thoughts by anyone else on the two options of wall we can go for? Ps still waiting on a steel price but husband does like the idea of making the C breast wider and using the left side for a drinks area. We checked the blogs but it seems to effect wine that is corked more as the cork deteriorates with the heat and the wine then gets oxygen in it which ruins it. 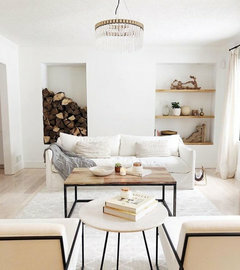 Looking at your second photo - how will you access the under stairs storage if you put shelving on right side of fireplace? The access door would have to be moved forward a bit and be made narrower to accommodate it. I was discussing it with the husband tonight as we could potentially cut another door from the other side (ie what wil be the 2nd bedroom) and hide that in a wardrobe as secret storage area. The opening would have to be narrow but still wide enough to walk theough but you wouldnt see it from the bedroom then. Nothing is ever straight forward!! Like the idea of a secret door/storage. Saw this today and thought of you. I know not your colour scheme or your now design but just how odd alcoves can work. Still cant decide so will make a decision once we have some pricing in i think. So i had an idea just now what to do with it! - Running it all flush across the whole wall. - Going to put the log store on the left side with bookshelves above it. - On the right side, matching bookshelf at the top and below, a set of nice narrow cupboard doors. Through those doors will be the entrance to the understairs cupboard! Whoop! That way we dont have to have a weird random door on the tv wall which i think will annoy me. Child bedroom wall design under alcove?